Washington • After weeks of shocking accusations, hardball politics and rowdy Capitol protests, a pair of wavering senators declared Friday they will back Brett Kavanaugh’s Supreme Court confirmation, all but guaranteeing the deeply riven Senate will elevate the conservative jurist to the nation’s highest court on Saturday. Some of them continued raising concerns that Kavanaugh would push the court further to the right, including with possible sympathetic rulings for President Donald Trump, the man who nominated him. But the case against Kavanaugh had long since been taken over by allegations that he sexually abused women decades ago — accusations he has emphatically denied. Collins told fellow senators that Christine Blasey Ford's dramatic testimony last week describing Kavanaugh's alleged 1982 assault was "sincere, painful and compelling." But she said the FBI had found no corroborating evidence from witnesses whose names Ford had provided. "We will be ill-served in the long run if we abandon the presumption of innocence and fairness, tempting though it may be," she said. "We must always remember that it is when passions are most inflamed that fairness is most in jeopardy." Those passions were on full display this week. And the fight could well energize both parties' voters in elections for control of Congress just five weeks away. The showdown drew raucous demonstrators — largely anti-Kavanaugh — to the Capitol, where they raised tensions by repeatedly confronting lawmakers despite an intensified police presence. It's all expected to conclude Saturday afternoon with a final roll call almost solidly along party lines. That would mark an anti-climactic finale to a tortuous clash that left Kavanaugh's fate in doubt for weeks after accusations against him first emerged. Both Utah senators, Republicans Orrin Hatch and Mike Lee, voted to end debate on Friday, as expected. The senators have been cheerleaders for Kavanaugh during the confirmation process with Hatch playing a key role in defending him from accusers and Democratic criticism. “The credibility and the integrity of our institutions are at stake. With our votes on Judge Kavanaugh, we have an opportunity to either rebuke the Washington smear machine, or give it free rein over our system of government,” Hatch tweeted Friday. The senator later praised Collins for supporting Kavanaugh and the reasoning she put forward in a lengthy speech on the Senate floor. That speech was the pivotal moment Friday. Collins, perhaps the chamber’s most moderate Republican, spoke for nearly 45 minutes. While she was among a handful of Republicans who helped sink Trump’s quest to obliterate President Barack Obama’s health care law last year, this time she proved instrumental in Trump’s effort to send Kavanaugh to the court and cast it rightward. "My heart goes out to anyone who has experienced any type of sexual assault in their life," Manchin said. But he added that based on the FBI report, "I have found Judge Kavanaugh to be a qualified jurist who will follow the Constitution and determine cases based on the legal findings before him." Republicans control the Senate by a meager 51-49 margin. 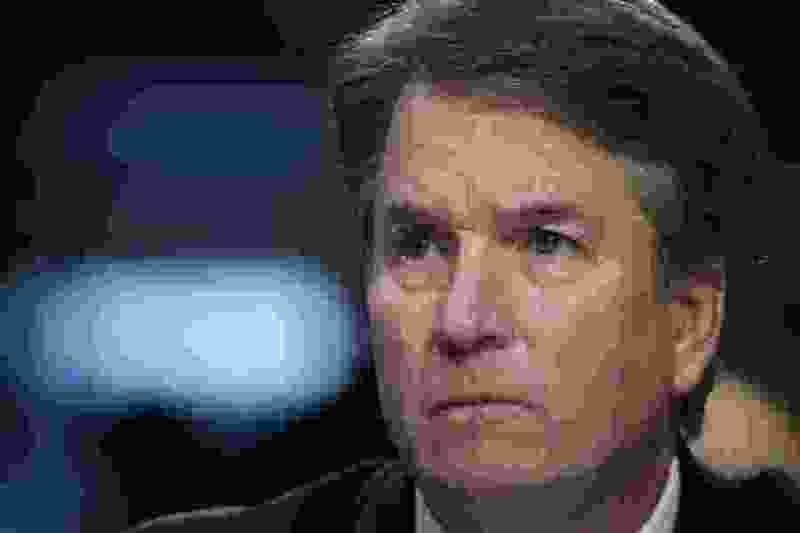 Support from Collins and Manchin would give Kavanaugh at least 51 votes. With the #MeToo movement and Trump's unyielding support of the nominee as a backdrop, both parties hope the bitter struggle will bring their most loyal voters to the polls Nov. 6. Three female GOP senators — Jodi Ernst of Iowa, West Virginia’s Shelley Moore Capito and Cindy Hyde-Smith of Mississippi — sat directly behind Collins as she spoke. Majority Leader Mitch McConnell of Kentucky sat directly in front of Collins and pivoted his seat around to face her. A few Democrats sat stone-faced nearby. Republican Lisa Murkowski of Alaska, a fellow moderate and a friend of Collins, is the only Republican who has indicated she will vote no. She told reporters that Kavanaugh is "a good man" but maybe "not the right man for the court at this time." Sen. Jeff Flake, R-Ariz., who has repeatedly battled Trump and will retire in January, said he'd vote for Kavanaugh's confirmation "unless something big changes." In a procedural vote Friday that handed Republicans an initial victory, senators voted 51-49 to limit debate and send the nomination to the full Senate, defeating Democratic efforts to scuttle the nomination with endless delays. That vote occurred amid smoldering resentment by partisans on both sides, on and off the Senate floor. "What left wing groups and their Democratic allies have done to Judge Kavanaugh is nothing short of monstrous," Republican Judiciary Committee Chairman Chuck Grassley of Iowa declared before the vote. He accused Democrats of emboldening protesters: "They have encouraged mob rule." On the other side, Senate Democratic leader Chuck Schumer of New York called the fight "a sorry epilogue to the brazen theft of Justice Scalia's seat." That reflected Democrats' lasting umbrage over Republicans' 2016 refusal to even consider Merrick Garland, President Obama's nominee to replace the late Antonin Scalia. When Trump nominated Kavanaugh in July, Democrats leapt to oppose him, saying that past statements and opinions showed he'd be a threat to the Roe v. Wade case that assured the right to abortion. They said he also seemed ready to rule for Trump if federal authorities probing his 2016 campaign's alleged connections to Russia try to pursue him in court. Yet Kavanaugh's pathway to confirmation seemed unfettered until Ford accused him of drunkenly sexually assaulting her in a locked bedroom at a 1982 high school gathering. Two other women later emerged with sexual misconduct allegations from the 1980s. Kavanaugh foes cast him as a product of a hard-drinking, male-dominated, private school culture in Washington's upscale Maryland suburb of Bethesda. He and his defenders asserted that his high school and college focus was on academics, sports and church. Democrats also challenged Kavanaugh's honesty, temperament and ability to be nonpartisan after he fumed at last week's Judiciary hearing that Democrats had launched a "search and destroy mission" against him fueled by their hatred of Trump. Tribune Washington Bureau Chief Thomas Burr contributed to this report.